Porsche Partners With Companies That Specialize In Beer, Batteries, and Bearings. Well Done! 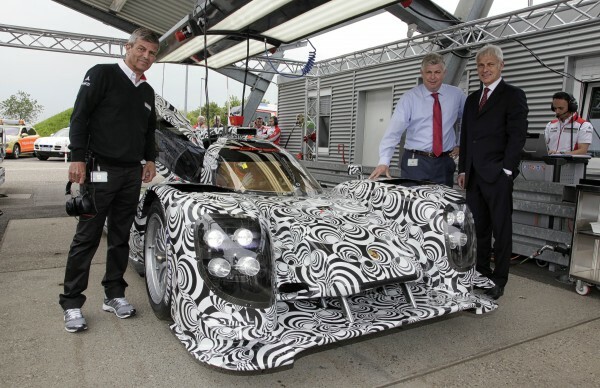 In a recent press release, Porsche outlined their technical and sponsor partners for the 2014 LMP1 program. None were particularly surprising, but each offer excellent opportunities. Three new partners were announced, as well as extending their existing partnerships with two further major international companies. Longstanding technical partnerships with ExxonMobil and Michelin will, unsurprisingly, continue through the 919 Hybrid LMP1 program. ExxonMobil will provide excellent bespoke engine lubricants under their Mobil 1 banner which has supported Porsche Motorsport for decades. Michelin, another supplier intimately familiar with Porsche Motorsport, will be providing the supremely durable and quick racing tires needed to be competitive in the LMP1 class. Wolfgang Hatz of Porsche (left) and Prof. Peter Gutzmer of the Schaeffler Group (right) gather to cement their companies' partnership. Porsche will also welcome the Schaeffler Group and A123 Systems as Official Partners of their new Motorsport program. Schaeffler is a renowned supplier of engine, gearbox and chassis technology, through their international brands; LuK, INA, and FAG. Schaeffler are well versed in the optimisation of combustion power trains, hybrid components, and e-mobility technologies. The the Schaeffler Group logos will be visible on the rear wings of both 919 Hybrid racers. A123 Systems is a US based development and manufacturing firm, specializing in advanced Nanophosphate lithium iron phosphate batteries and energy storage systems. Porsche called on their expertise to assist in the development of the energy storage system for the highly complex 919 Hybrid. A123 Systems is the exclusive battery cell supplier for the LMP1 team, making a leading contribution to the development of the complex hybrid system. While technical partnerships are the perfect types of relationships for Porsche to be building, helping their cars to be the best they can be when they roll to the grid, sometimes it is important to have a partner to help you celebrate your victories once they've been achieved. In a perfectly Germanic fashion, Porsche is proud to announce that C. & A. Veltins brewery will also be joining the LMP1 program as an Official Partner. Veltins has supported Porsche GT3 Supercup teams since 1997, and will now be stepping up to help Porsche take on the World Endurance Championship in the LMP1 class. The premium beers of the brewery with a longstanding tradition from Meschede-Grevenstein in Germany will be on offer in the team and brand hospitality. Veltins has further plans on the docket to further "activate" their relationship with Porsche. While associate sponsors and Official Partners have been announced, no word has been made in regards to a title sponsor, or potential livery design. We expect these to surface soon, however, so keep an eye on FLATSIXES.com for all the latest Porsche LMP1 news. Though they were not mentioned explicitly, existing Porsche Motorsport technical partnerships with other companies like Adidas and Bilstein parent company Thyssenkrupp are expected to continue.